Do You Need an Eye Exam in Milton, ON? Regular eye exams are important, regardless of your age or health. During a complete eye exam, your eye doctor will not only determine your prescription for eyeglasses or contact lenses, but will also check your eyes for common eye diseases, assess how your eyes work together as a team and evaluate your eyes as an indicator of your overall health. We recommend that children should have their eyes examined at least every 12 months or according to their eye doctor’s instructions. Read about Children’s Eye Exams. At Martin Street Optometry, our optometrists recommend having a comprehensive eye exam every 1-2 years, depending on your age, your overall health, and any eye conditions you might have. In keeping with the recommendations of the Canadian Association of Optometrists, we recommend more frequent eye examinations for adults with diabetes, high blood pressure and other disorders, because many diseases can have an impact on vision and eye health. In addition, it is best practice to have your eyes examined annually if you are a contact lens wearer. If you are over 40, it’s a good idea to have your eyes examined every one to two years to check for common age-related eye problems such as presbyopia, cataracts and macular degeneration. Because the risk of eye disease continues to increase with advancing age, everyone over the age of 65 should be examined annually. We use the most up-to-date technology to ensure the best eye care possible. 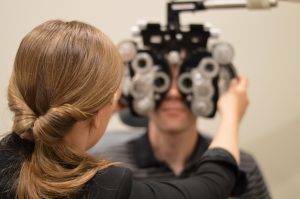 Learn about the different types of tests and equipment you may experience on a visit to Martin Street Optometry. This program was developed to raise awareness among parents of the importance of having their childrens’ eyes examined upon starting school.